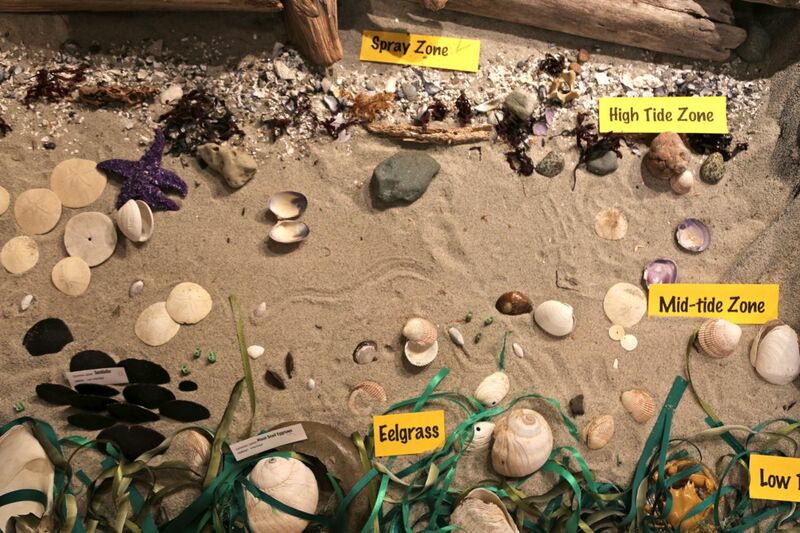 Gabriola Museum’s mission in creating BeachQuest is to connect our enjoyment of our beaches with a sense of stewardship and responsibility for them. The more we learn about marine life, the more we respect how genuine it is, worthy of protecting for generations to come. BeachQuest – Discovering Gabriola’s Marine Life is a colourful, illustrated guidebook to five of Gabriola Island’s beaches. It was published by the Museum in 2014 (see Sounder newspaper article at bottom of page). The book is supported in the museum by an exhibit showcasing a marine life beach diorama. Kits to help you get started exploring our beaches can be borrowed or bought at the Museum Gift Shop. This page is designed to give you a glimpse of what you can learn from the book. 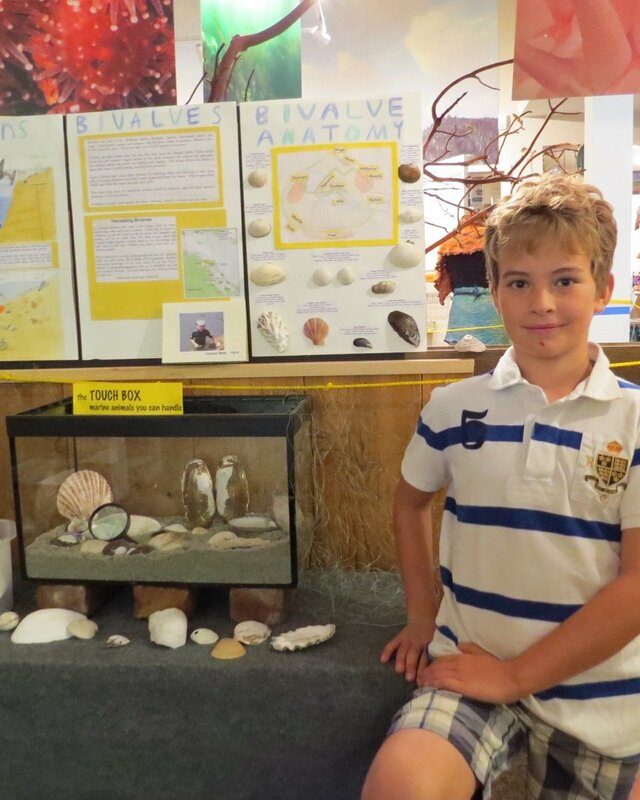 Connor Reid, age 10, has installed his BIVALVES Exhibit at the Gabriola Museum, next to the existing BeachQuest Marine Exhibit. He’s interested in exploring the smaller organisms of the ocean, rather than the more popular marine animals like dolphins and whales. He wants to dig into the things people don’t know – like the importance of harvesting enough clams from Brickyard Beach so that the beach does not become overpopulated with clams. He designed the exhibit originally as a class assignment for Ms. Kate Reynold’s class at Gabriola Elementary School. With encouragement from marine biologists Edith Kraus and Ken Cripps, he took his research further and expanded his exhibit to include safe harvesting as well as habitat. Christy Wilson, a marine biology educator advised him on how to teach people about the ocean. He then went on to present at both Oceans Day and a local kids camp of groups from ages 5-15. The exhibit includes a Touch Box with a varied selection of shells. It can be viewed at the Gabriola Museum weekend days from 10:30 a.m. to 4 p.m. through Thanksgiving Day. 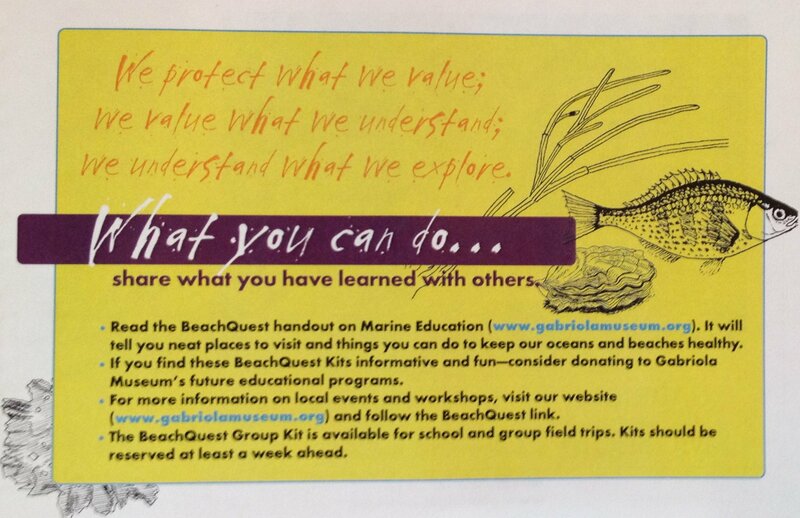 BeachQuest also dedicates individual pages to specific marine life. Quirky and interesting details capture how the plant or animal lives, how it interacts with its environment, and amazing facts about its biology. …Do you know where the madreporite is on a Sea Star, or what it does? 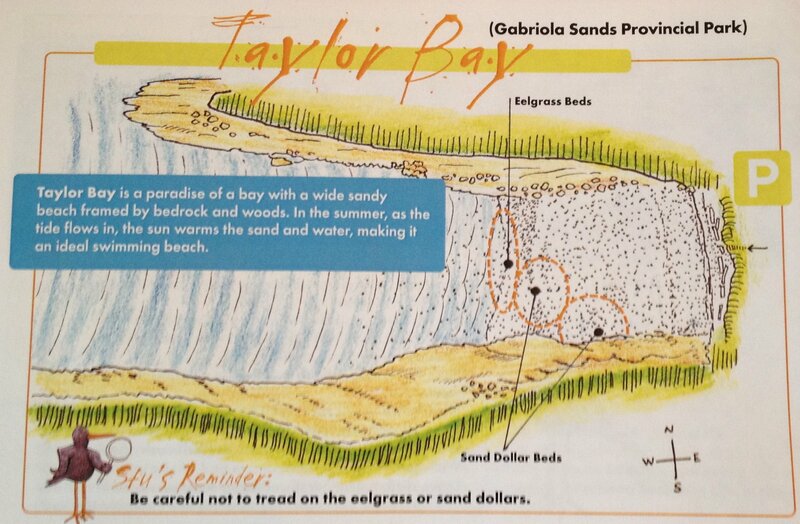 BeachQuest presents maps of each of the five featured beaches. 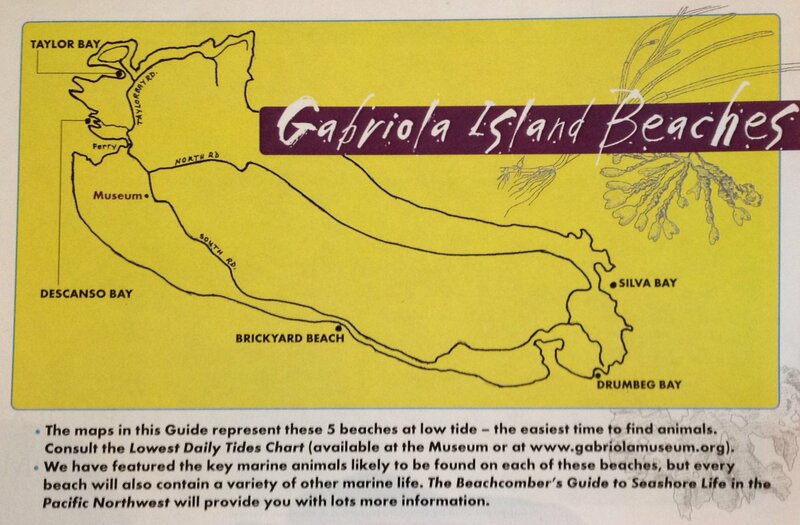 The clearly drawn maps highlight where to look for many of the amazing and essential plants and animals found in the intertidal environment such as Sea stars, Eelgrass beds, Sand Dollar beds, Sponges, and Tidepools. 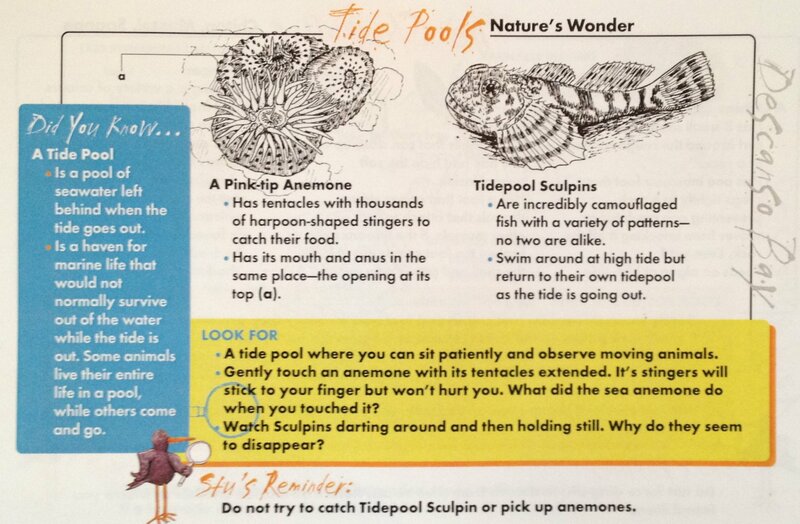 The BeachQuest mascot, Stu the Oystercatcher, has a reminder on each page to help new explorers respect the beach and its inhabitants. Underwater forests (bull kelp), mini aquariums (tidepools), and “cling-ons” (mussels) are just a few of the extraordinary plants and animals we have access to on Gabriola’s remarkable shoreline. Surrounded by the Salish Sea (Georgia Strait) and its 3,000 species of marine life, this island has a range of beaches, each with its own identity. Brickyard Beach has rich oyster and clam beds, and Drumbeg Park overlooks tidal currents and whirlpools. Descanso Park and Taylor Bay have valuable eelgrass beds that provide nurseries for hundreds of marine animals. 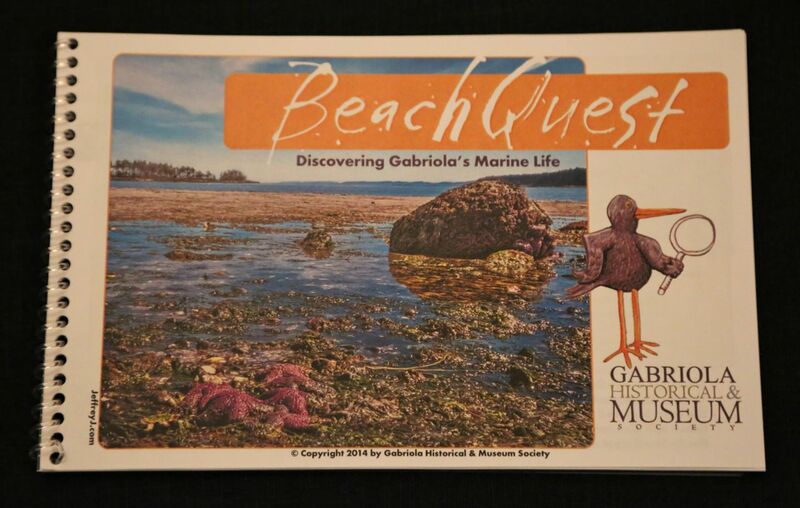 The Gabriola Museum has just published BeachQuest, a guide with maps of five Gabriola beaches and illustrations of the twenty plants and animals most easily found on each of them. 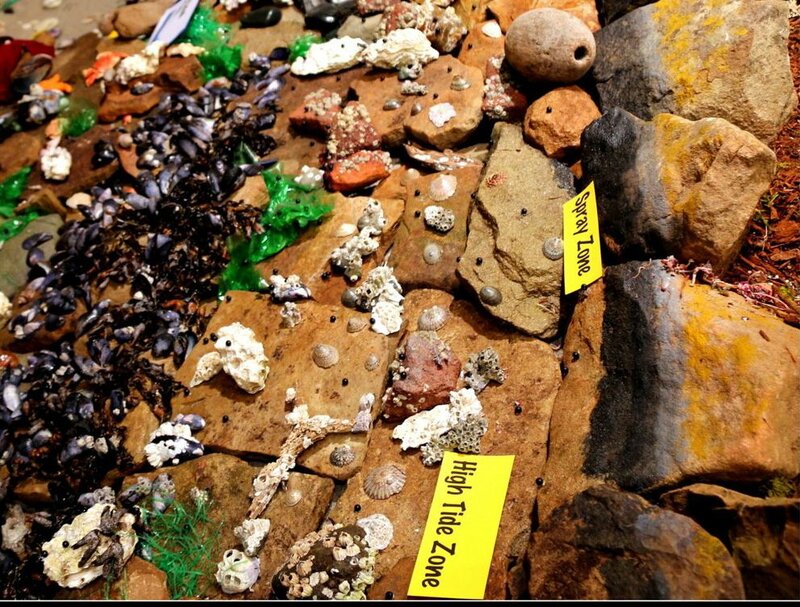 BeachQuest is also a new exhibit at the Museum, displays of the marine life that lives at each of the intertidal zones of a beach, and of the animals that live only underwater. BeachQuest is a new initiative at the Museum that is designed to appeal to families and schools, and encourage a sense of stewardship for our marine environment. Initial funding by the Gabriola Recreation Society and the Small Islands Studies Conference enabled a collaboration between the Museum’s Carroll Hodge and April Vannini; and talented volunteers Edith Krauss, marine biologist/educator; Devon Featherstone, artist/illustrator; and Nancy Boyes, graphic designer. Marine biologist/photographer Ken Cripps donated underwater photographs to the exhibit, Jeffrey James created the book’s cover photographs. BeachQuest guides are available at the Museum, Descanso campground office and the Gym @ Twin Beaches. Copies will also be available soon at the Gabriola Library.